Should be out within the next two months or so. Excellent choice for the box art. Oh man, I'll need another one of these. Hopefully it's molded in white this time. That would be a nice bonus. But I would rather deal with flash, then have to overcome red plastic, or than terrible tan plastic that seems like it just keep soaking up primer. Wow, that box art excites me about the same as it did over 50 years ago when I bought my first one. This nostalgic box art thing is great marketing... will have to pick one up! Despite having 4 of the Lindberg Kits in the stash (3 Yellow, 1 tan) I'll need this one. Can't wait to see the decals for this one. So nice to see this truck come back. I built one in 1974,and sadly made a rat rod out of it in the 2000's. I will buy a couple & redo it like the 1974 box art. The LHS still had some on the shelves a few months back, so I picked on up. I probably saved $20 this way, and I have a use in mind for the billet wheels that came with the kit. Interesting, not quite a 100% pure reissue of the original. Looks like chrome reverse rims will be provided instead of original wheel covers. 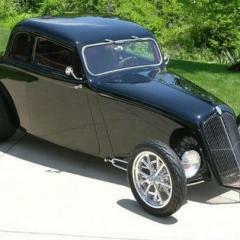 Guessing it will probably be the same rims provided in the 1936 Ford 3-window reissue from a few years ago? I'm sure a few people will be disappointed, but honestly I suspect the vast majority of purchasers will prefer these. Aside from the original wheel covers, were there any other optional parts that were lost to time and not included in the Lindberg reissues? I would be surprised if one single person laments the loss of those full wheel covers. Oh, I'm sure somebody will. I certainly won't be one of them. Consider yourself surprised, Casey! Why have all of the vintage decals & stuff if you can't replicate the OI box art? 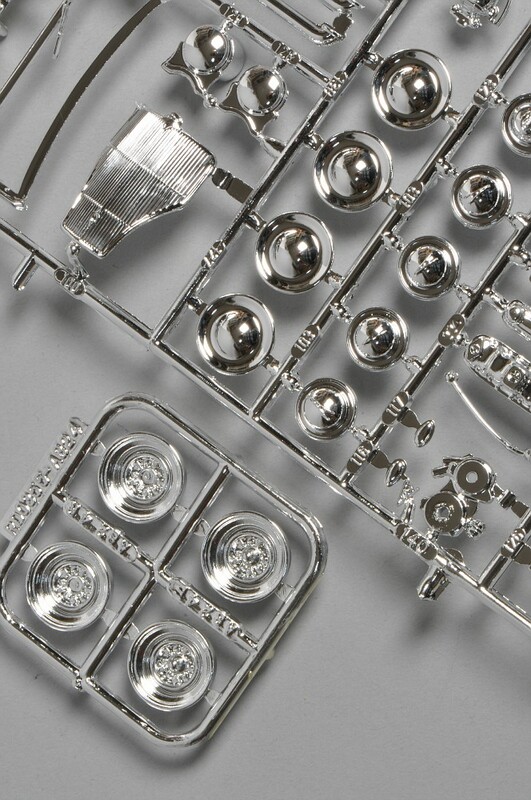 Of course the good thing about this release is that they'll be using the polished molds that give the plastic its shine. That would be great for novice builders who still don't paint their kit bodies. The other obvious factor I didn't think about till now is that with the side-mount spare, they can't just throw a set of four wheels in from a different kit. So pretty much no way they're throwing the wheels from the '36 into this kit. I've been waiting for awhile for this one to come back as an AMT kit. Lindberg's box art was enough to keep me away. Pretty sure that the bed cover was in the issue from lindberg that was molded in yellow. Not sure about any of the other issues. Here is hoping that the "lost" parts can be restored by merely opening some blocked off sprue runners. OK guys, just got a look at the final release an hour or two ago. Of the "missing" parts Casey shows above, the only flares and the fire extinguisher appear to be missing in the new kit. 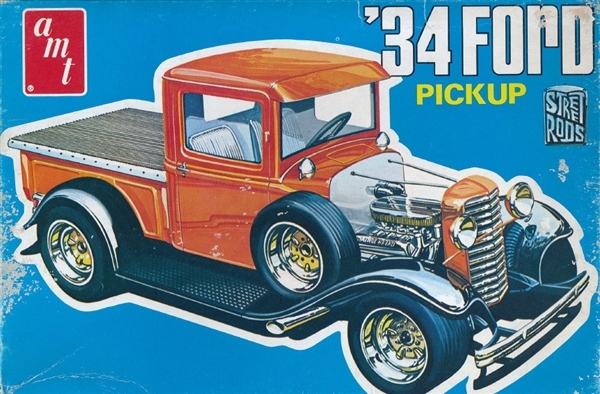 The cement blocks, tire rack, and gas can are on a separately packaged runner (non-plated), while the jack and the trophy top (a miniature 1934 Ford pickup) are on a second, separately packaged small runner of plated parts. And yes the tonneau cover is there as well. The instruction sheet is a rebop of the original c.1962/3 AMT Trophy Series sheet; of the page Casey showed above only the fire extinguisher and flares are missing from the instruction sheet. 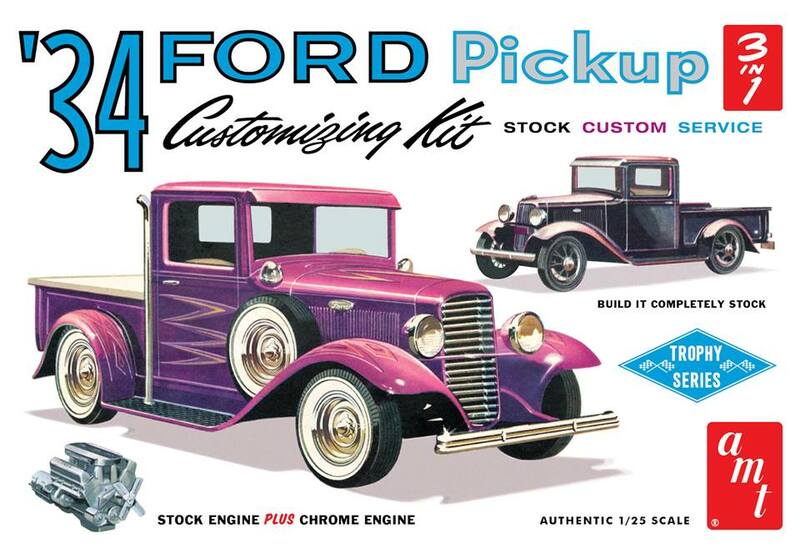 The instruction sheet also includes the "Kustomizing Hints" attributed to George Barris from the original kit release. 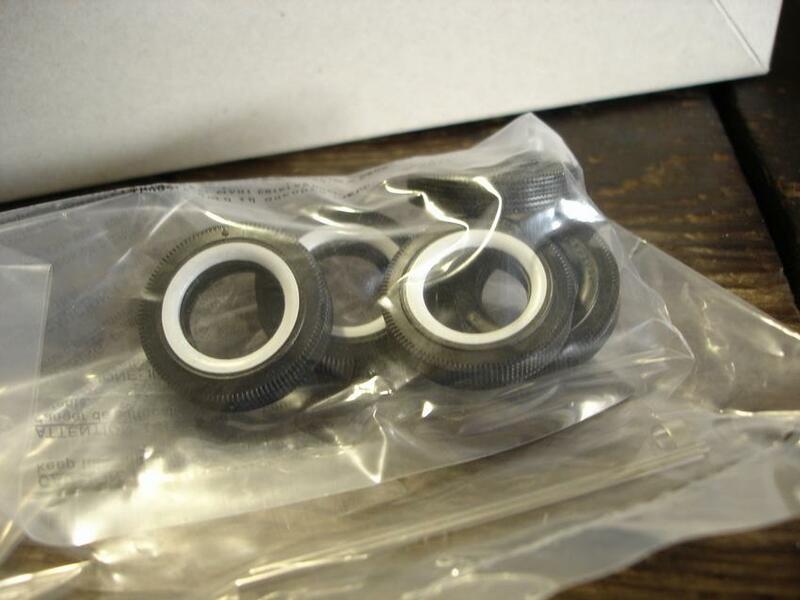 The chrome reverse wheels are on a new, separately packaged plated tree; they are slightly simplified in detail vs. the 1936 Ford Round2 kit parts illustrated earlier in this thread. Five wheels are provided (including one for the fender mounted spare). The 1980's style pseudo billet wheels from the Lindberg releases are still there on the large plated parts tree, but not mentioned in the instructions. The decal sheet appears to be largely an enhanced rebop of the original....I believe the colors for the Ford service oval are new on this sheet vs. the original. The tires are five pad printed wide whitewalls. The box itself as illustrated above, is of the typical large Round 2 size, not the narrow/smaller size of the Trophy Series original. The kit is molded in white styrene. And molded in white. Is this the very first time this kit has been molded in white? I may have missed: is it molded white or another color?